NADCO supplies one-stop solutions for a variety of industrial labels, safety decals, and customized stickers for manufacturing, advertising, or recreation. We also provide graphic designing, digital printing, die cutting, prototyping, and more. Pressure sensitive adhesive tape consists of a continuously flexible strip, typically on a roll, lined with permanently tacky adhesive on one side. PSA tape adheres to a broad range of surfaces, requiring only light finger pressure to create a lasting bond. Common constructions of PSA tape include cloth, paper, metal, or plastic with coating on one or both sides. PSA tape can also incorporate a blend of natural or synthetic rubber and resin as well as silicone, acrylic, or other polymer systems that may or may not contain additives. Pressure sensitive labels are custom labels with an adhesive that responds to pressure without the need to apply water or other solvents. Workers can apply pressure sensitive labels to any surface with little effort, making them well suited for a broad range of consumer products. Although end users only see the printed layer, pressure-sensitive labels actually consist of many layers, with each layer serving a specific purpose in the manufacturing process. Pressure-sensitive labels include a face-stock or printed layer, the adhesive layer, and a liner. The liner includes a release coating, which allows workers to remove the face stock and adhesive and apply the label to the product. Foil: Foil’s strength and versatility render it ideal for seaming, masking, and sealing tapes. Foil tapes resist weather, bend easily, and conform to irregular or uneven surfaces. Mylar: Mylar bonds well with a variety of challenging surfaces, creating adhesion that lasts for the product’s lifetime. Mylar consists of bright brushed silver polyester and has excellent dimensional stability, consistent surface smoothness, and endurance to varying temperatures. Vinyl: Perfect for labeling or striping, vinyl resists heat, bacteria, and corrosives, and it meets OSHA requirements. It can include ink-receptive coating and write-on capabilities. Paper subhead: Paper meets the widest variety of industrial applications. Paper tapes come in numerous forms, allowing you to customize its printability, tensile strength, removability, and more. Pressure sensitive adhesive tapes and labels use thinner, lighter materials and form bonds with a wide range of surfaces, reducing assembly time for your final product. They provide uniform thickness and gap-filling characteristics while also insulating against noise and vibration. Using pressure sensitive tapes and labels also eliminates the need for mechanical fastenings or surface refinishing. 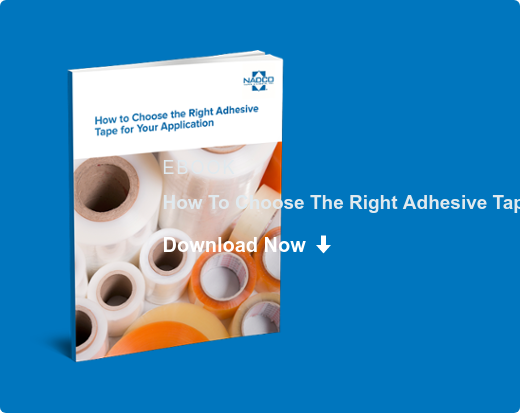 What are the Advantages of Pressure-Sensitive Tapes? What are the Advantages of Pressure-Sensitive Labels? Stick with NADCO for Your Adhesive Needs! NADCO provides high-quality, pressure sensitive tapes and labels along with additional full-service graphic designing, digital printing, die cutting, prototyping, and more. We're eager to help design your next custom printed tape or label. Contact us directly or request a quote today!